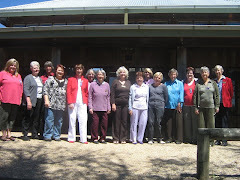 This special day, Saturday the seventh day of the seventh month of the seventh year of the new century provided ladies from the AAO3 Zone with a chance to attend the Mc2 online Computer and Website Training Course presented by Robin Vargo from Melbourne who is the Online Groups Project Coordinator. The course was organised by Zone Councillor Fiona at the Smith Family House in Woden and was attended by ladies from Lake George Day VIEW Club, Woden VIEW, Bungendore Evening VIEW Club, Queanbeyan Evening VIEW Club, Belconnen VIEW Club, Crookwell VIEW Club and Goulburn VIEW Club. Please let me know if I have missed any club. 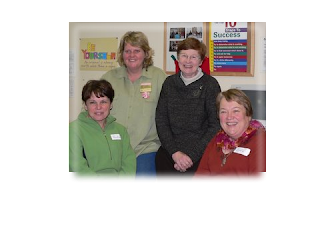 (Left to Right) in the photo we have Pauline, Fiona, Robin and Lydia. It was great to meet some of you at Woden on Friday and Saturday and thank you for making me feel so welcome. I enjoy reading your club's Blog and it is good to show other VIEW Clubs at my online training sessions that there is more than one way that a club can present themselves on the web. Hopefully I'll catch up with some of you at Tamworth in September. Come and say 'Hello' at the Midday Show. If you'd like to tell others about your Blog hang around the booth. I'll give you a nifty badge so they'll know you're full of useful information. Sorry but I won't be at Tamworth in Sept so won't see you there. Perhaps you can come and visit us in Canberra again sometime soon and we can show you around.